Your power bill will go up next year if Southern California Edison gets permission from state regulators to spend nearly $600 million to make its equipment less likely to start wildfires. Adding high definition cameras, small weather stations and drones to better detect and track fires. The bottom line for your bill if you're an average Southern California Edison customer? About $1.20 more per month, increasing the typical $111.32 monthly charge to about $112.45. 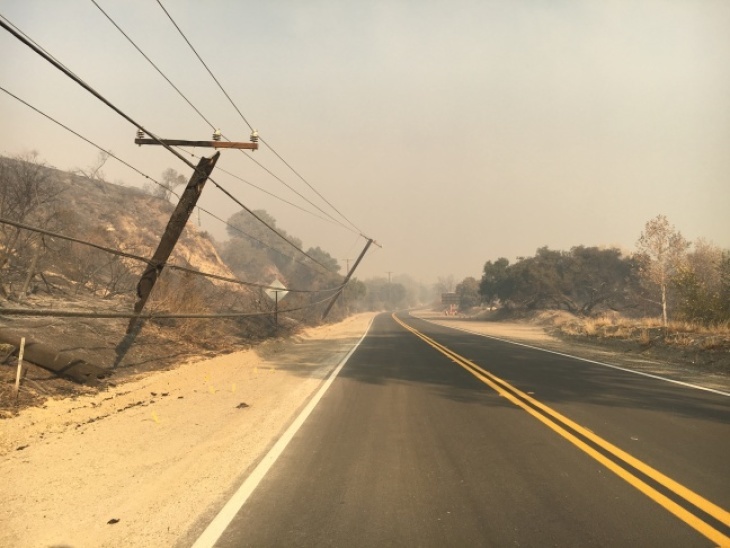 "The reason we're doing this is to address the increased wildfire risk and to provide a better, safer, more resilient (power) grid," said Bill Chiu, SCE director of grid resiliency and public safety. IT'S ALL PART OF THE "NEW NORMAL"
As temperatures rise, and drought continues, fires have become more frequent and destructive. California utilities say this "new normal" requires changes, including higher bills to help pay for it. Eight of the state's 20 most destructive fires have happened since 2015, five of them in 2017, Chiu said. He is directing the project to make Edison lines less likely to cause or spread fires. Consumer advocates are watching any rate changes closely. "You can nickel and dime people to death," with these incremental increases in utility bills, said Mindy Spatt, spokeswoman for TURN, a nonprofit utility watchdog organization. The test for Edison's new plan, which she had not seen yet, would be whether it is a cost-effective expenditure, and really does make Edison equipment less likely to cause expensive, destructive fires. A bill awaiting Gov. Jerry Brown's signature calls on investor owned utilities like Southern California Edison to do more to reduce the fuel load — the foliage and debris and millions of dead trees that keep fires burning once they're sparked — in wildland areas near homes. Spatt has described the bill, SB 901, as one that "gives utilities a blank check" to pass costs to consumers. SCE is already supposed to be clearing trees and vegetation from around power lines. This new request filed Monday with the California Public Utilities Commission, involves additional steps and permission to pass on the cost to customers. For example, Edison says it will take a more aggressive approach to clearing vegetation near power lines in high fire risk areas. "We're not proposing to completely clean out all vegetation," within 200 feet of power lines, said Bill Chiu, SCE director of grid resiliency and public safety. "What we're proposing is to take a much more aggressive action to inspect and identify trees that potentially could pose a hazard." The focus would be on diseased trees or ones with structural defects, that could fall onto power lines or lose limbs in a high wind that could land on power lines. The company proposes to replace bare power lines with insulated wires in some fire-vulnerable areas, adding about 4,000 miles of insulated lines by the end of 2025. Edison already has state approval to cut power to communities on those dry, windy red flag days when its equipment is especially likely to start or spread fire. It proposes to to make those shutdowns more palatable to affected communities by rolling in portable generators where residents can charge their phones and computers. Edison plans to install equipment to help it detect fires earlier. It will place up to 160 high-definition cameras to help firefighters respond faster to fires, helping limit their spread. The company will also install up to 850 new weather stations that can feed data to weather modeling tools that can forecast weather conditions for very small areas. The company also plans to tackle another issue that causes problems in a fire — controlling when power lines get re-energized. Edison wants to install more devices that, on hot, dry, red flag days, will keep power lines from being automatically re-energized after power is lost. In a high fire risk area, the automatic devices can re-energize a power line that has been hit by a flammable branch, causing a new fire. The new spending would pay for drones to help inspect power lines before power begins flowing through them again.